Some weeks back I was given an Nespresso machine as a birthday gift 🙂 and when I opened the box I was hoping George Clooney might have made a surprise appearance… I think he may have been a bit busy! But like George Clooney in the advertisement for Nespresso… ice cream and coffee are perfect partners in the culinary world. I am soooo in “coffee love” with my Nespresso machine, which are effortless to use. At the Nespresso store in Bahrain’s City Center Mall, you can try samples of the coffee before buying, very helpful when choosing your favorites. Affogato is a classic Italian dessert which consists of a scoop of vanilla ice cream drowned in a shot of hot espresso. The contrast in the hot and cold, sweet and bitter makes this dessert very pleasurable to eat. Affogato makes a wonderful after dinner dessert, combining dessert and coffee into one. Of course you don’t have to limit yourself to having this simple treat at dinner parties… I don’t. If you want a coffee flavored ice cream… have an Affogato… it’s that simple. Ramadan signifies a month of fasting in which Muslims must refrain from eating and drinking from dawn until sunset, which lasts for 29 to 30 days according to the Islamic calendar. Ramadan is a time of spiritual reflection, worship and charitable giving to others less fortunate. At sunset family and friends gather to break the days fast with a meal know as Iftar, each household preparing their favourite main dishes followed by desserts and sweets. This is the month when I usually drink more Arabic coffee than any other time of the year. 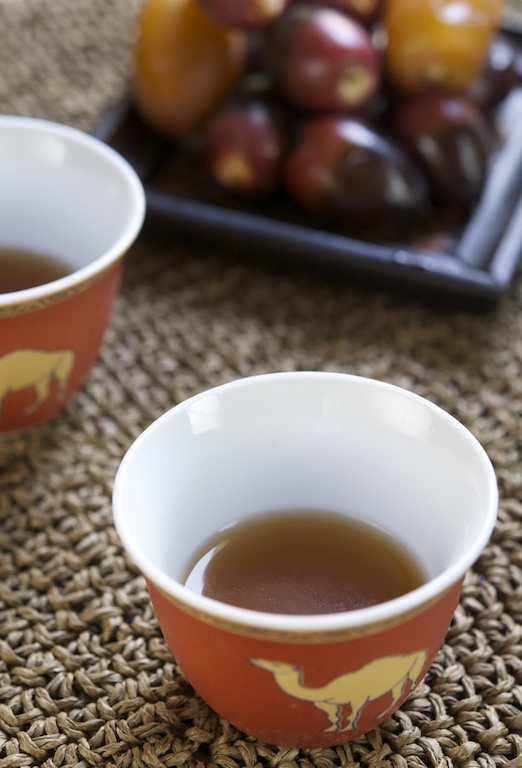 Arabic coffee is associated with tradition and hospitality in Bahrain and the Gulf… visit any Arabic family’s home and even some establishments and you will always be welcomed with a serving of Arabic coffee, with an offering of dates or other sweets. Arabic coffee or qahwa is served in a small delicate cup called a finjan and only filled to one-third, filling anymore than this with Arabic coffee is not considered good etiquette! The Arabic coffee pot or dallah is always held with the left hand and the small cups filled with coffee served with the right, guests receiving the Arabic coffee should do so with their right hand. Usually it is customary to serve no more than three cups of Arabic coffee, in which the guest should at least accept one cup… wiggling (custom) the cup from side to side when finished. I love Arabic coffee and when visiting my in-laws house the customary three cups of coffee usually goes out the window! 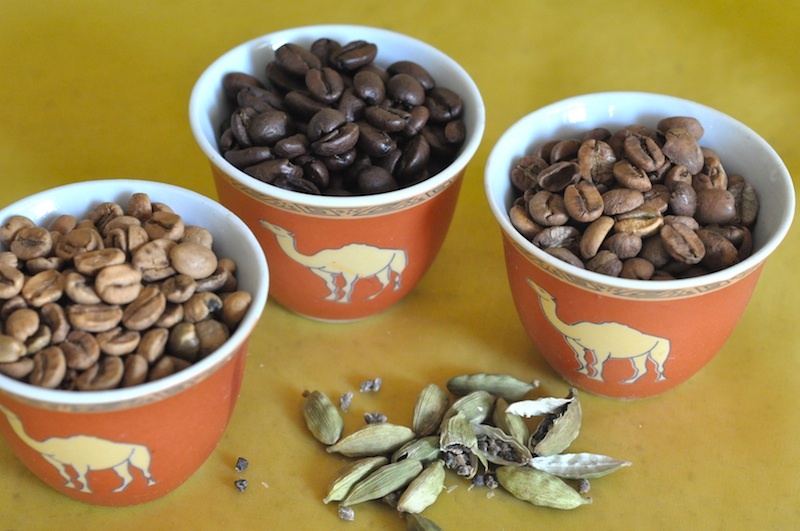 For me Arabic coffee is very light and refreshing (not to be confused with Turkish coffee), with warm and welcoming aromas and flavours of light coffee, cardamom and saffron! How do you like your Arabic coffee? 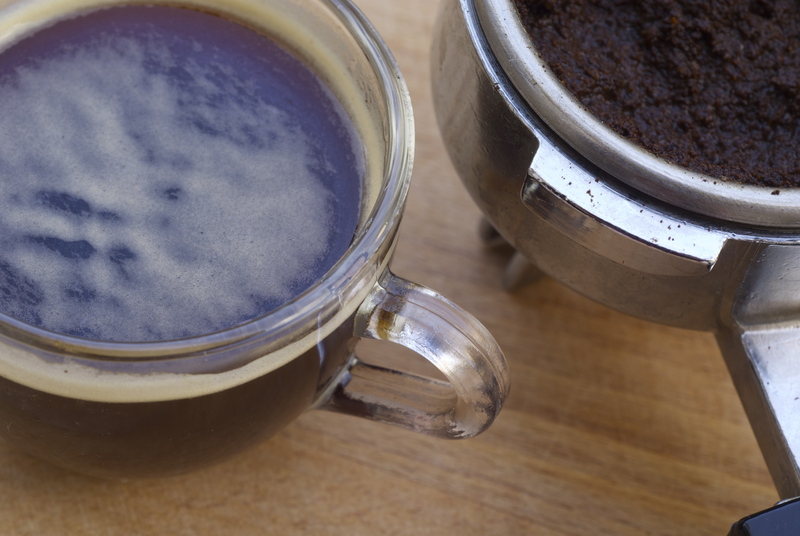 Do you prefer using light, medium or dark roasted coffee beans or maybe even a mix! Do you favour using more or less cardamon? Do you like saffron? Each person and household will have their own preference and taste when it comes to Arabic coffee! Roasting green coffee beans is also carried out in some households and I believe you can even roast coffee beans using a popcorn machine! I thought this was an interesting video on the colour and roasting stages of coffee beans… should the urge ever take you! These golden coloured whole coffee beans can be bought at the local roasters in Bahrain, which also sell ready ground versions of Arabic coffee mix, as well as nuts, sweets and spices. 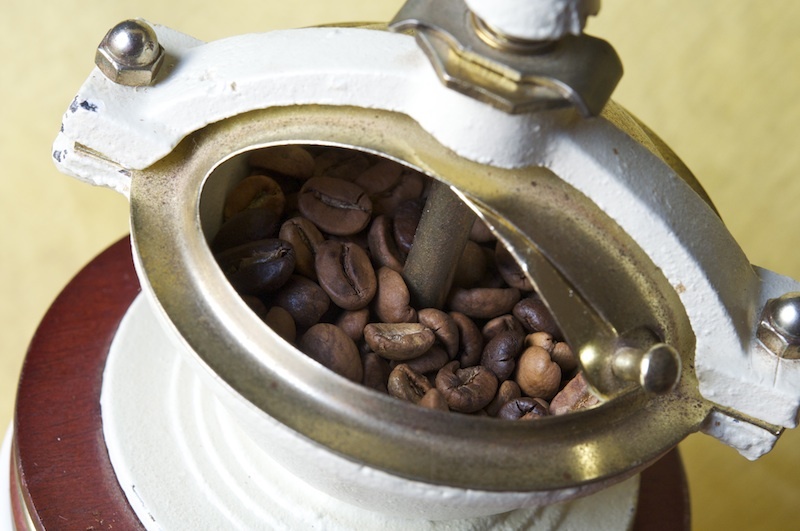 When making Arabic coffee I buy the lighter roasted coffee beans at the roasters and also use some of Starbucks Blonde (not so blonde looking) roasted coffee beans, freshly grinding all in a coffee grinder! 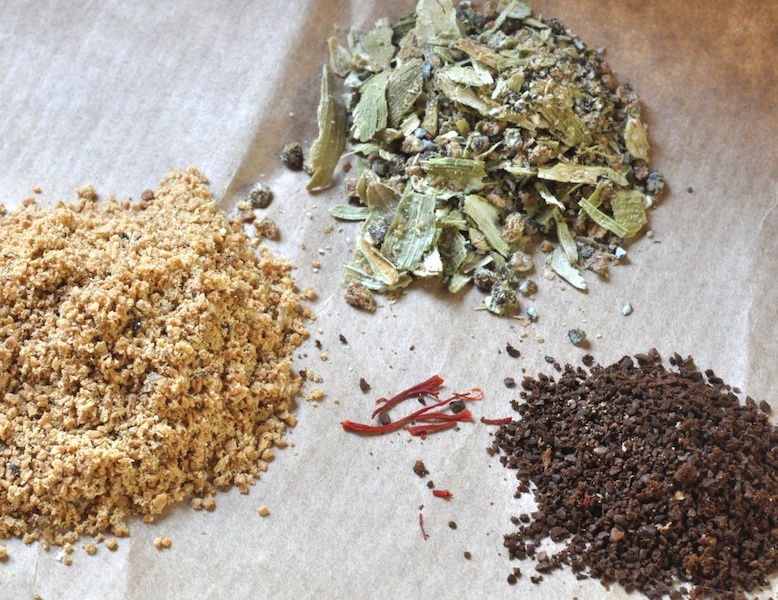 The coffee beans and cardamom can be ground together, but I prefer grinding the cardamom in a spice grinder… wanting to keep the coffee grinder just for coffee! Nowadays thermos flasks are used (some look like the traditional coffee pots),for keeping Arabic coffee hot for a couple of hours! A thermos flask for the sole use of Arabic coffee is advisable, the lingering flavours never seem to quite leave the flask once it has been used for Arabic coffee! How to make: Bring the water to a rolling boil in a small saucepan, then turn off the heat. Add the cardamom and coffee to the boiled water giving the saucepan a quick swirl. Leave the contents of the saucepan to sit for about three minutes. Meanwhile pre-warm a thermos flask with some boiling water which should be emptied before filling with the Arabic coffee. Before pouring the Arabic coffee into the flask, if necessary, re-heat the contents of the saucepan to almost boiling as Arabic coffee should always be served hot. Strain the Arabic coffee through a small strainer into the thermos flask and add the saffron. Discard the contents of the strainer. 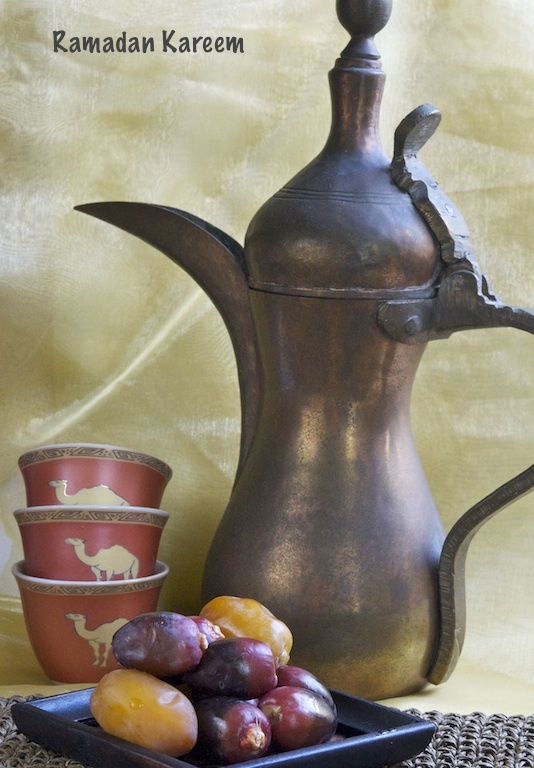 Arabic coffee should always be served with dates or sweet pastries! Now that the days have turned somewhat colder, warm comforting drinks like this winter spiced latte are on the menu. Make it a tall, grande or supremo. You can make a healthier version and use soya milk, also leave out the whipped cream topping… however when it comes to comforting drinks… the full monty please! Pour the milk into a saucepan and heat to almost boiling, remove from heat and stir in the vanilla extract, pumpkin spice and soft brown sugar. If you do not have an espresso machine make up some strong coffee instead. Pour the espresso or strong coffee into a large mug and fill with the hot spiced milk. Top with a dollop of whipped cream and drizzle over some maple syrup.